I love to host brunch at home, too, and since we are in the midst of the holiday season this is the perfect time to think about gathering friends or family together for one. 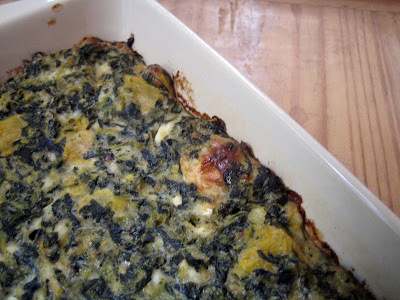 A favorite brunch dish for me to make is this Spinach Cheese Bake. 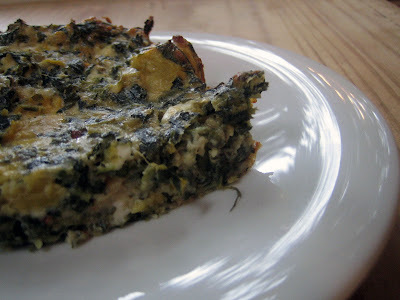 It is savory and satisfying, with crispy corners (my favorite part!) 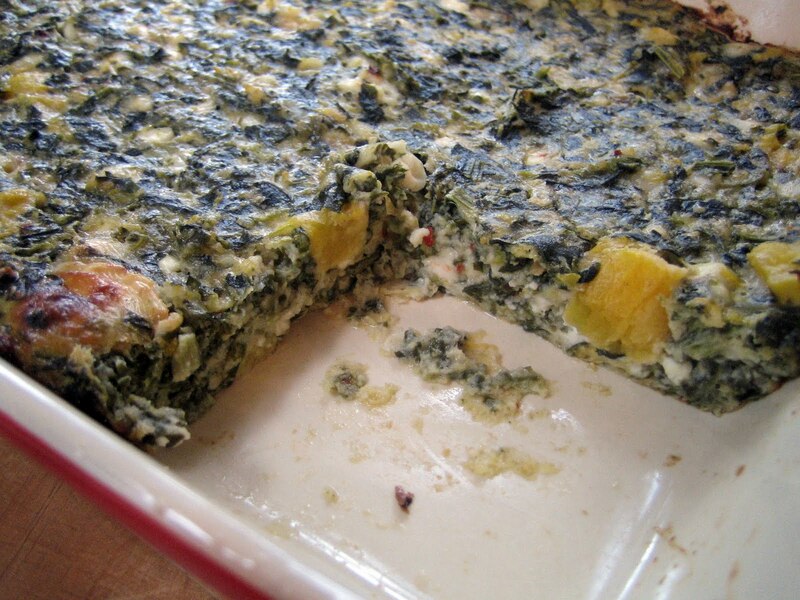 and a flavorful mix of herbs and cheese. 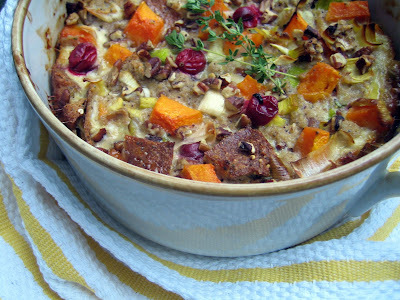 I’ve been making and tweaking this casserole for a number of years. It’s popular with adults and kids alike - my boys always pounce it. You can tailor this to your taste - be creative with the cheeses and herbs you choose or add additional flavors such as roasted chilis, sautéed mushrooms or caramelized onions (in this version I include butternut squash for the season). Served with some yogurt and granola or with freshly baked muffins (always lovely to get both the sweet and savory), you have an easy brunch to enjoy. 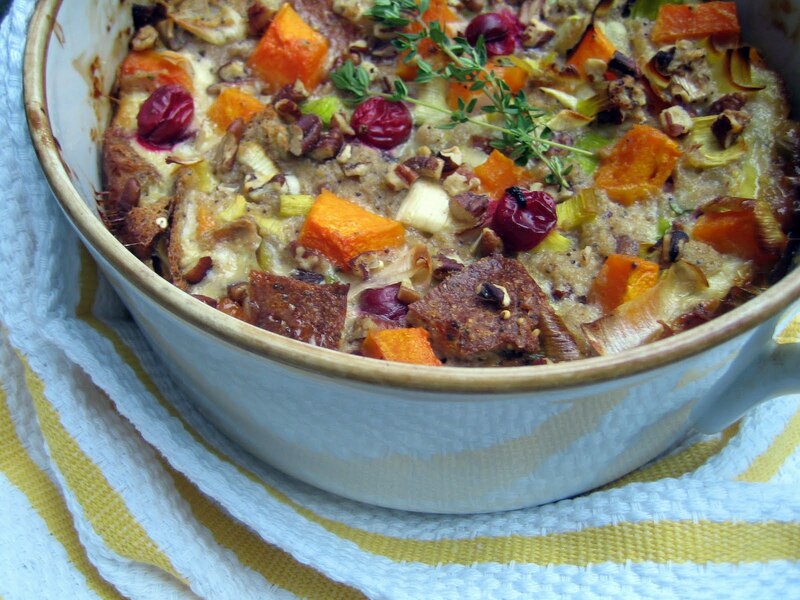 This casserole can also be prepared the night before and popped in the oven to bake in the morning, leaving you time to sip coffee with your guests and relax. If using fresh spinach, steam until wilted, drain well and chop coarsely. If using frozen spinach, defrost and squeeze well. Set aside. Preheat oven to 350 degrees. Butter a 9x13 inch baking dish. In a large bowl, stir together the eggs, cheeses, flour, garlic, salt, green onions and chili peppers. Gently mix in the spinach and butternut squash. Pour the mixture into the prepared baking dish and bake for 40-45 minutes, until the casserole is set, golden brown on top and the edges are crispy. Serve warm. You can prep this the night before (but don't bake) and refrigerate it overnight. In the morning, bake and serve as directed. I’m having a slow start to this week. We’ve just returned home from Washington, DC where my brother, Tim, and sister-in-law, Kristen, hosted an incredible Thanksgiving dinner for us, my parents and my brother, Mike. We all enjoyed a long holiday weekend together with sightseeing, walks in the sunshine, football and good food. Watching my sons with their sweet younger cousins warmed my heart and I’m feeling particularly thankful to have had this time with my family since next summer Tim, Kristen and their children are moving to Hanoi (Tim is in the Foreign Service). Sigh. A bit more difficult to spend time together but we look forward to Thanksgiving in Vietnam sometime. A simple soup is a welcome meal after a holiday weekend of indulgent eating. This red lentil one is quick and easy to pull together with pantry staples (and no pureeing involved). A bowl of warm nourishment. 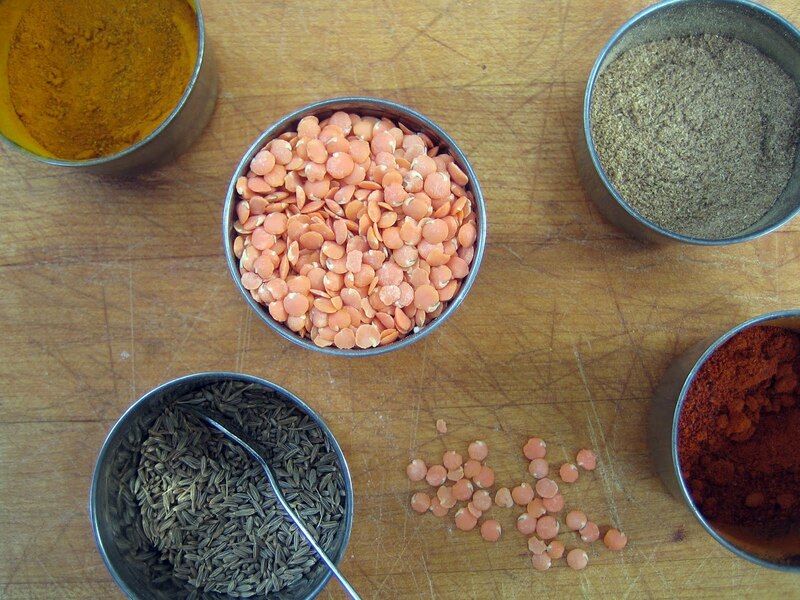 I love opening my tin of Indian spices to inhale the scent of cumin seed, ground coriander and turmeric - all of which flavor this soup. 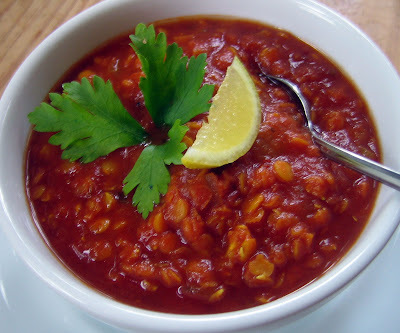 The tomato base creates a fresh, hearty taste, crushed red chile peppers give a spicy kick and a splash of lemon juice pulls it all together (you can also add a dollop of sour cream or Greek yogurt if you prefer some creaminess). Stirring a pot of soup is a time for reflection and evokes warm feelings of the past few days for me. I am grateful for time spent with people I love and that we could gather around the table to celebrate a holiday together. I hope your Thanksgiving weekend was enjoyable and shared with loved ones, too. In a large soup pot, warm the oil over low heat and add the cumin seeds, coriander and turmeric. Stir for a few minutes until fragrant and the seeds darken. Add the onions, garlic and red chile peppers. Increase the heat and sauté until the onions are soft. 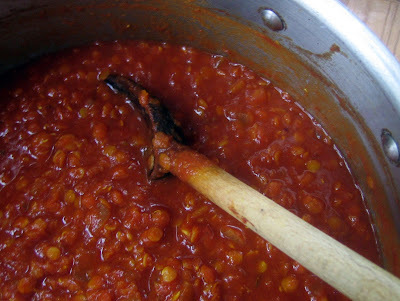 Add the water, lentils, tomato puree and paste, salt and pepper. Stir to combine and bring to a boil. Lower the heat, stir again and simmer uncovered for about 25 minutes. 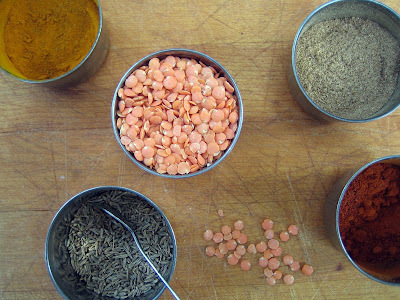 The lentils should be very soft and the soup thickened. Remove the soup from the heat and stir in the lemon juice. Taste for seasoning. If the soup is very thick you can add a little more water or lemon juice. 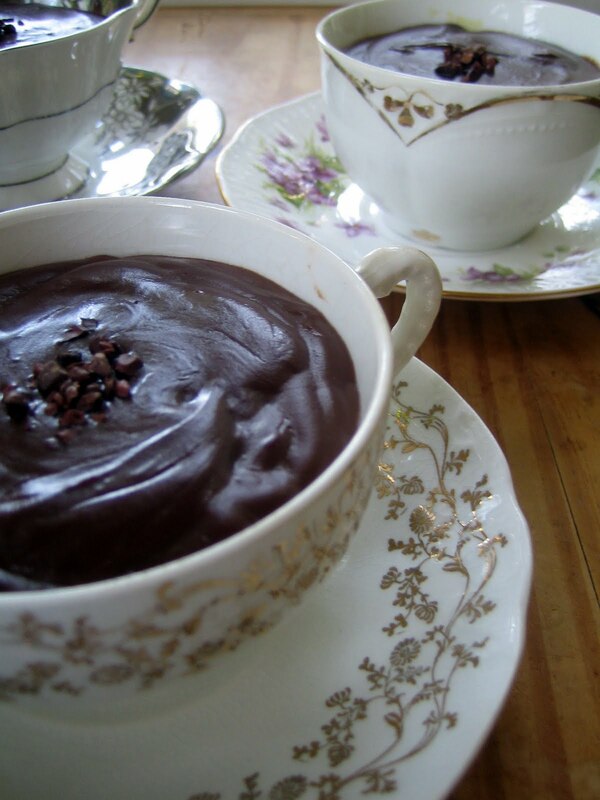 Serve warm with sour cream or yogurt. 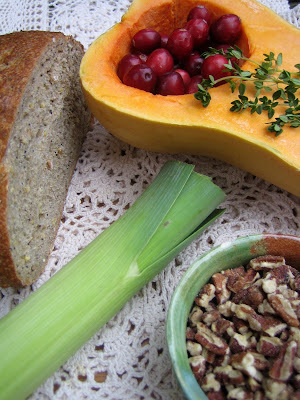 We’re in the midst of Thanksgiving preparations, possibly the biggest cooking week of the year. Grocery stores are crowded with shoppers preparing for their feasts and food magazines are showcasing a dazzling array of new recipes. So many tempting creations I’d love to make – whew, it can be a little overwhelming! Time for something simple, a dish with just a few ingredients that takes little effort and delivers big taste. Brussels sprouts can be counted on here. I am always intrigued by the tall stalks of fresh Brussels sprouts standing proudly at the farmer’s markets and can’t resist bringing some home. There are many ways to savor these green orbs. Lightly steamed and tossed with butter and toasted walnuts, Brussels sprouts show off their bright color and pair well with nutty, buttery goodness. Sprouts are also terrific when shaved raw into a fresh slaw with grated fennel and Parmesan. But the absolute best way to enjoy these cute little veggies is by roasting them. Roasting brings out sweetness in many fruits and vegetables, and Brussels sprouts are no exception. 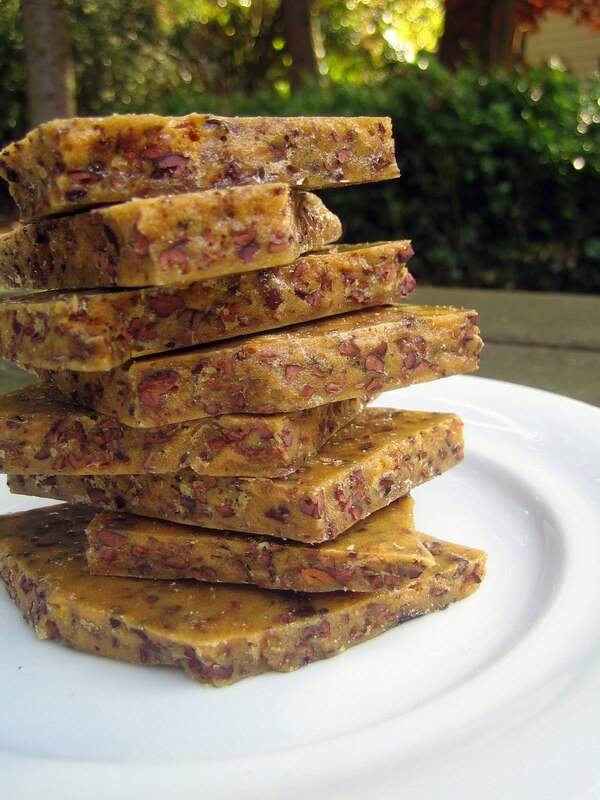 Add a touch of maple syrup and you have my kind of candy. 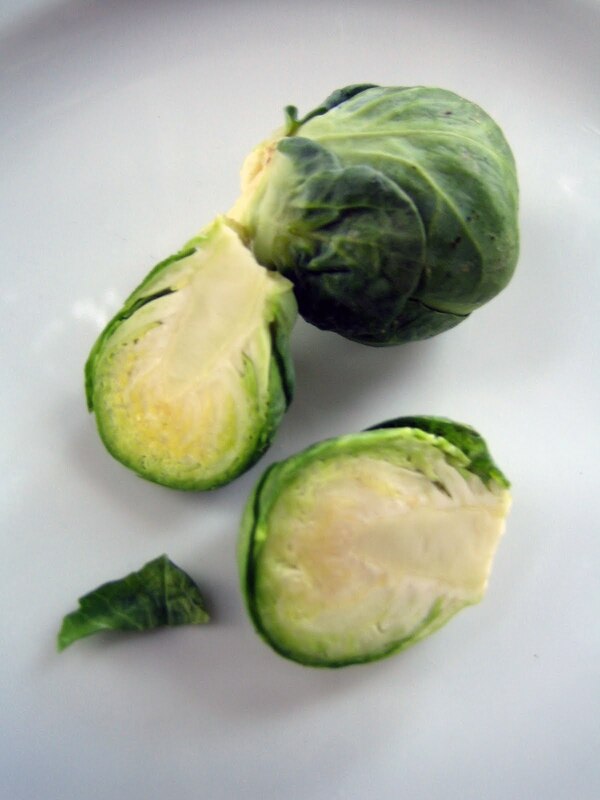 I usually have to double the amount I roast due to so many nibblers attacking the baking pan as the sprouts cool. Maple syrup and a dash of balsamic vinegar form an irresistible glaze – who wouldn’t sneak a few? 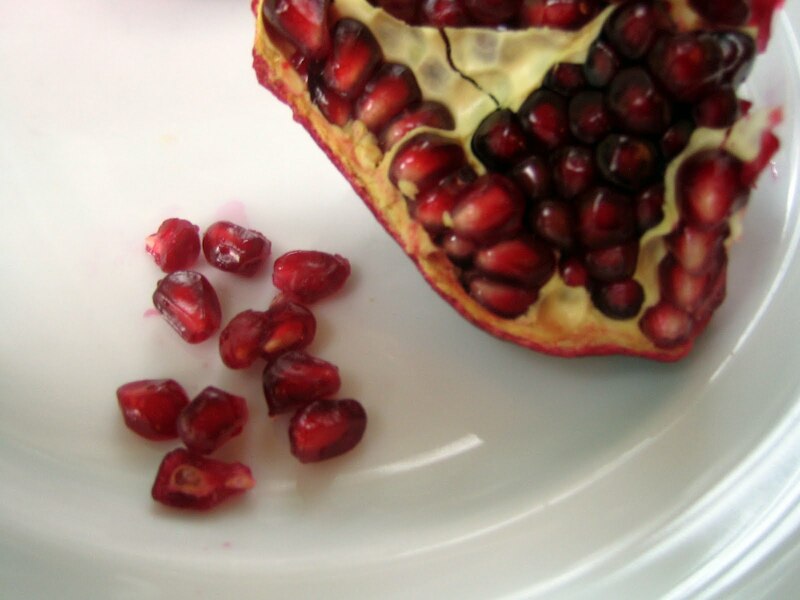 For a pop of flavor and color, toss in some pomegranate seeds (I’ve been crazy for these lately, topping my oatmeal and yogurt with them, too.) The crunchy, juicy seeds combine beautifully, yet simply, with the crispy, sweet, sprouts. 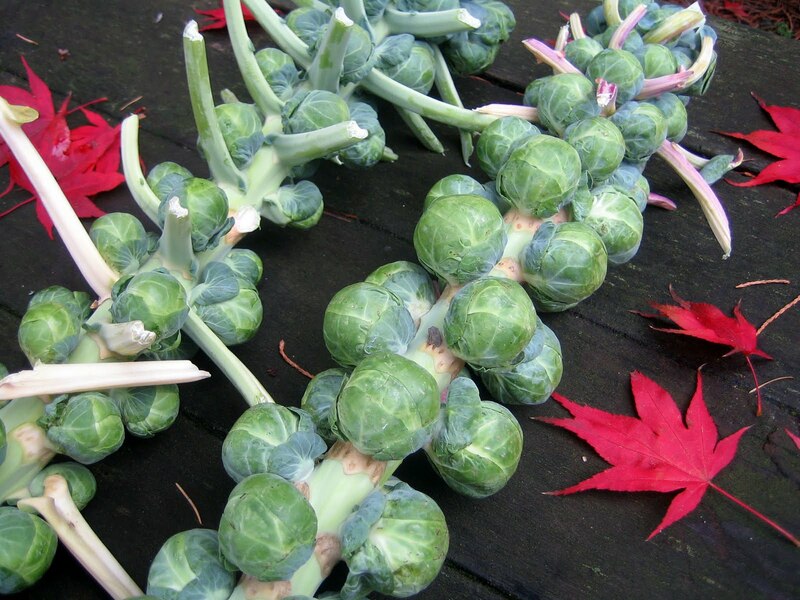 And fortunately Brussels sprouts will be in season for a while, so there’s plenty of time to enjoy them. Preheat the oven to 375 degrees. 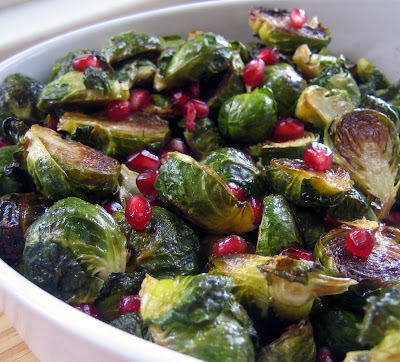 In a mixing bowl, toss the Brussels sprouts with a few drizzles of olive oil. 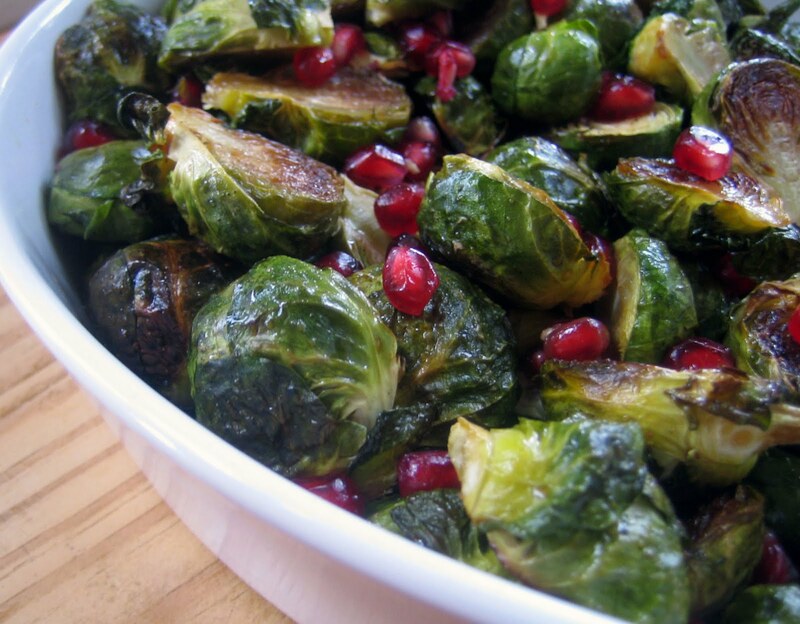 Spread the sprouts in a single layer on a rimmed baking sheet, cut sides down. Roast for 20 minutes, or until the sprouts are tender and deep golden brown on their cut sides and showing some crispy edges. In a small bowl, whisk the maple syrup, vinegar and salt together. Remove the baking pan from the oven. Drizzle the syrup mixture over and use a spatula to lift the sprouts and gently toss to coat. Spread evenly again. Return the baking pan to the oven and roast for another 5 minutes. Combine the Brussels sprouts with the pomegranate seeds in a serving bowl and enjoy. This time of season evokes thoughts of family traditions and memories of holiday celebrations. Thanksgiving, in particular, sends me flying back to my childhood table. When I moved away from home and began cooking in my own kitchen, I took many of my mom’s recipes with me. They were the building blocks in the creation of my own repertoire of recipes and I am still cooking many of them years later. Every year, I pull out the five pages of handwritten Thanksgiving recipes from my mom. 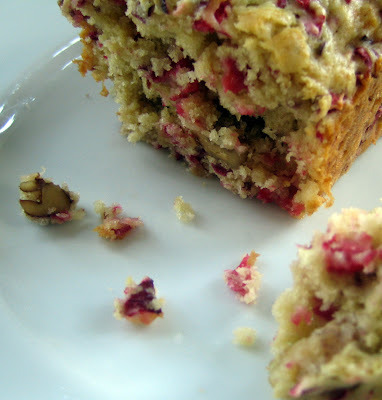 In these pages she shares her menu for dishes such as scalloped corn supreme, cranberry salad, autumn stuffing, cranberry velvet pie and her delectable sour cream coffee cake (wonderful for breakfast on Thanksgiving Day). She includes notes and tips from her experience in preparing this holiday feast - so helpful for me as a novice cook, and great reminders now! She ends the pages of notes by writing, “Good luck – a lot of fun work and worth it!” I have found this to be very true. 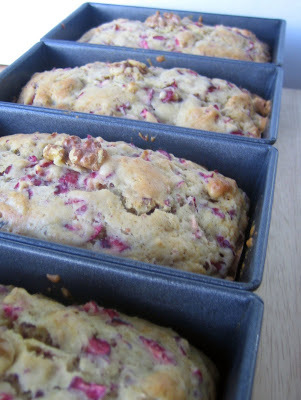 Looking over these splattered, rumpled pages, I lingered on the recipe for cranberry bread. It’s a recipe my younger brother, Mike, brought home from his preschool (as noted by my mom) and that we enjoyed on our Thanksgiving table every year after that. 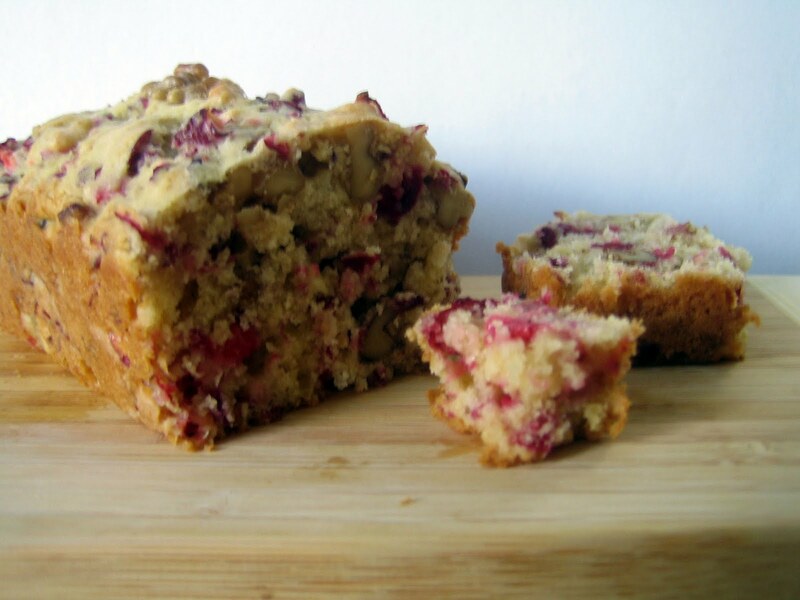 It’s full of fresh cranberries and toasted walnuts, with a subtle citrus flavor. My mom always baked the bread in mini-loaf pans and placed one at each person’s setting on the table. I loved having my own individual loaf and carefully cutting little slices to devour! As I got older, I began making this cranberry bread myself and it always tastes of Thanksgiving and family to me. Thanks, Mom. Preheat the oven to 350 degrees. 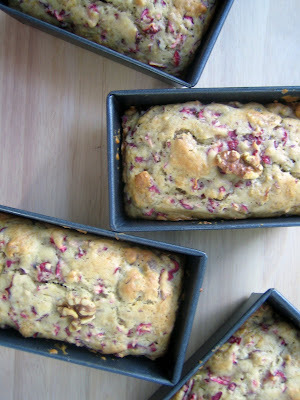 Butter a 9x5 loaf pan or 4 mini-loaf pans. In a large mixing bowl, cream the butter and sugars together. Add the egg and orange juice and mix until blended. 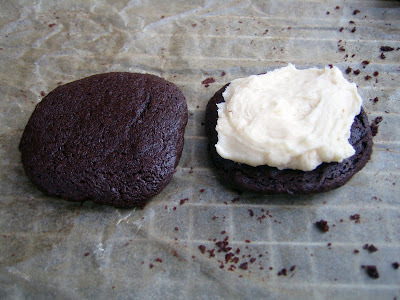 Sift together the flour, baking powder, baking soda and salt and beat into the butter mixture. 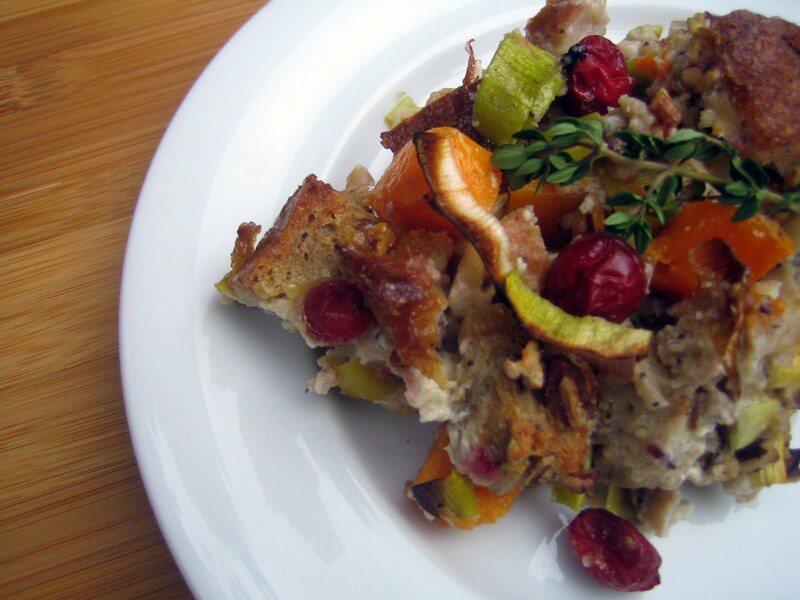 Gently fold in the cranberries and walnuts until just mixed. Spoon the batter into the prepared pan(s) and bake until golden and a tester has just a few moist crumbs on it (about 25 minutes for mini-loaves, 45 minutes for a big loaf). Let cool before removing from pan(s). I have another new cookbook release to tell you about! 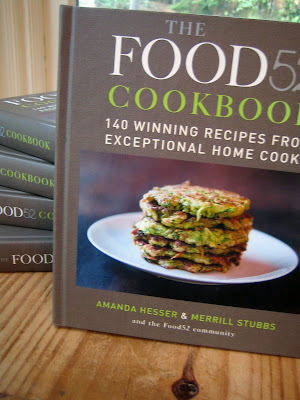 Yes, I am officially a cookbook junkie. 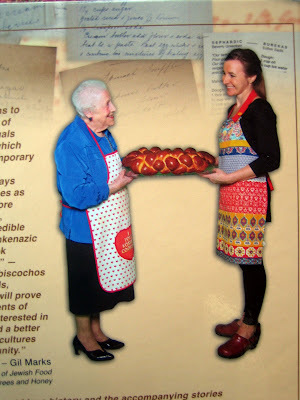 I treat cookbooks like novels, reading them page by page and immersing myself in the recipes, stories and photos. You can learn deeply about a culture or time in history by reading about what was being cooked and why. And then you get to create and eat the food! This new book, Yesterday’s Mavens, Today’s Foodies, is a treasure of recipes and stories compiled by the Washington State Jewish Historical Society. It is full of history and anecdotes passed from generation to generation. The recipes are classic (Mama’s Gefilte Fish), intriguing (Blind Date Cake) and contemporary (Mojitos for a Crowd). 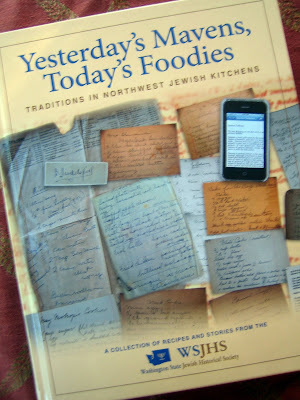 You will find quite a range here: Ashkenazic and Sephardic, old and new, sweet and savory. I had the pleasure of being involved in a small way ... if you turn the book over I am pictured on the back cover with Katherine Scharhon, a Seattle cook known for her delectable recipes. Together we are “yesterday’s maven and today’s foodie.” It was an honor and thrill when my friend, Leah, asked me to take part (and fun to have my first photo shoot!). A lovely event was held to celebrate the launch of this new collection. Leah, who is an incredible chef and caterer, cooked a wide array of dishes from the cookbook. Pumpkin borekas, quinoa tabouli, dolmas, zucchini quesado, faux chopped liver and herring and beet salad ... and the desserts! Oh my. The dish that I went back for seconds of (perhaps even thirds) was the Party-In-Your-Mouth Salad. You just have to try something with a name like that, right? This colorful salad is sweet and tangy, chewy and crunchy. The flavors come alive together and create, well – a party. Wild rice is combined with dried apricots, almonds, currants, dried cranberries (pomegranate seeds could be marvelous, too), garlic and red onion and dressed with a zippy vinaigrette. I recommend trying this one as a side on your holiday table or, since it multiplies easily, anytime you are feeding a crowd. Cook the rice in the broth for about 45 minutes, until the rice is soft and kernels pop open. Transfer the rice to a bowl and let cool. 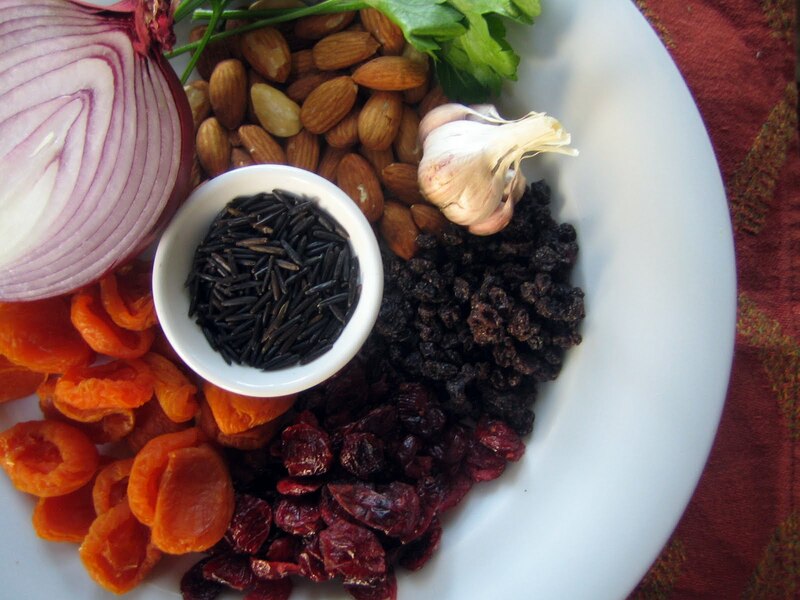 Add the apricots, cranberries, currants, cranberries, almonds, red onion, parsley and garlic to the rice and stir gently. Combine the vinegar and mustard in a small bowl. Gradually whisk in the olive oil. 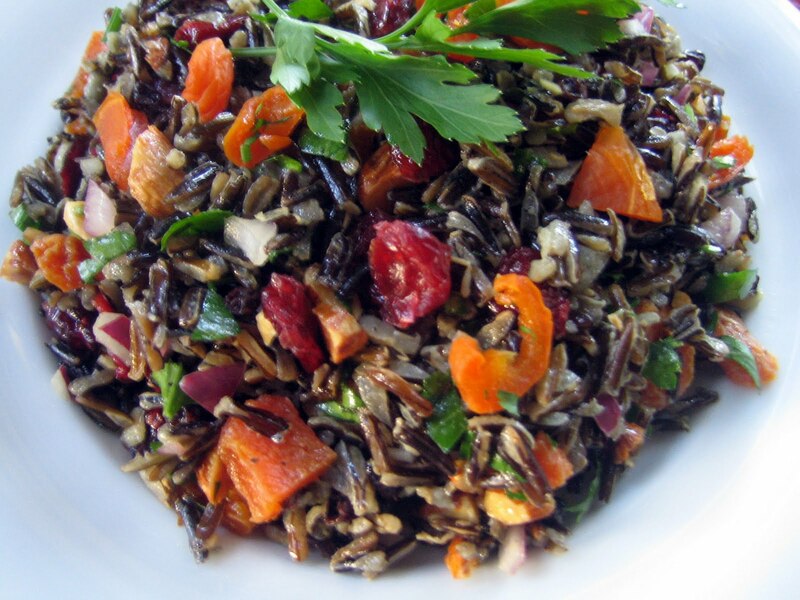 Toss the rice salad with your preferred amount of dressing, season to taste with salt and pepper and serve. 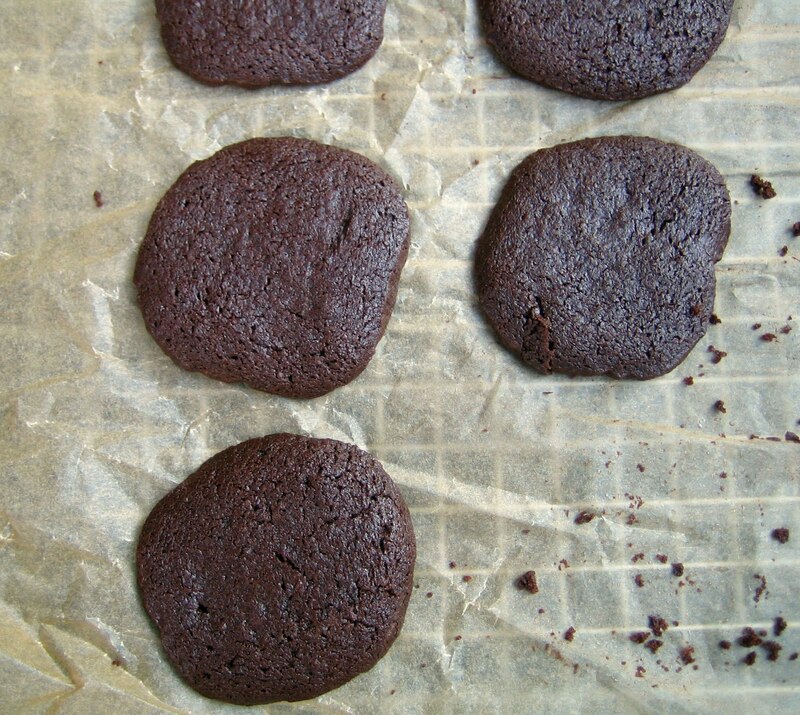 This will come as no surprise – I love to bake. The act of baking is meditative and relaxing for me, it centers me, and if I haven’t baked in a while then I tend to feel a bit unbalanced. All is well in my world when flour is flying and butter is softening! 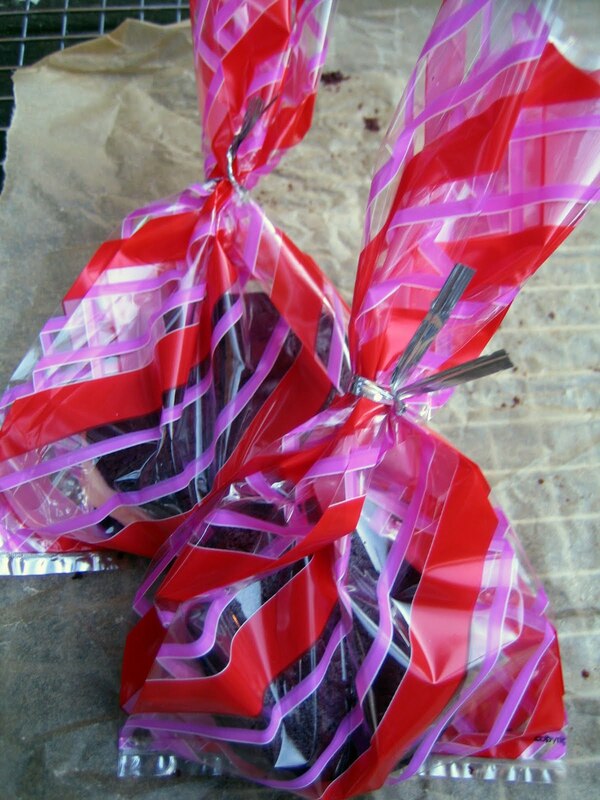 Even more special than baking, though, is sharing the goodies with my family, friends and anyone who appreciates a homemade treat. So when I learned about the Will Bake for Food bake sale I was excited to join in. I get to bake and share for a good cause. 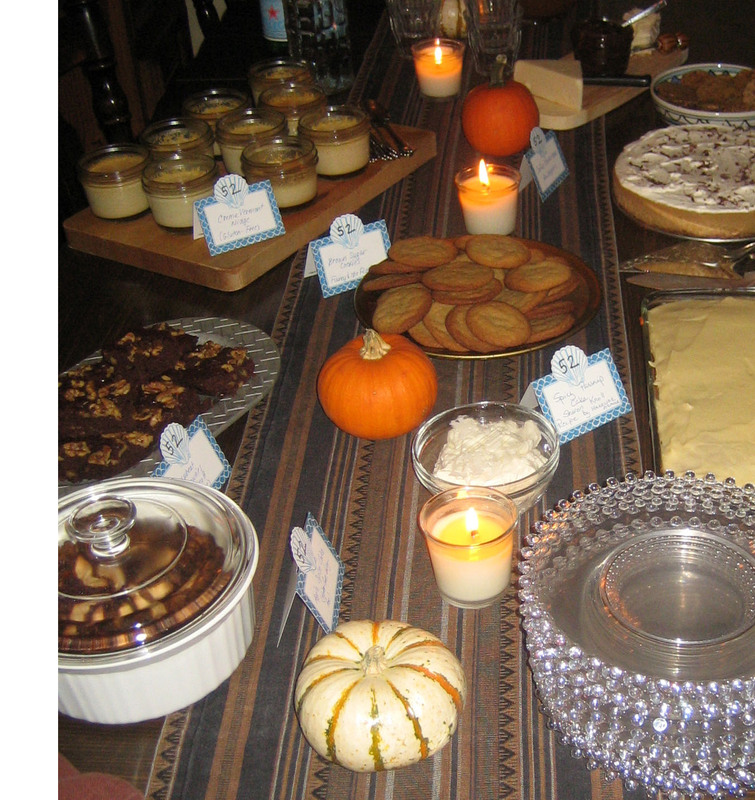 On Saturday, November 12th, a group of Seattle food bloggers will be baking up sweet delights for the community – you! – so come by and indulge. Please bring either non-perishable food items or money to exchange for baked goods. I promise you will not be disappointed! All the proceeds and food donations will benefit Seattle’s Emergency Feeding Program. 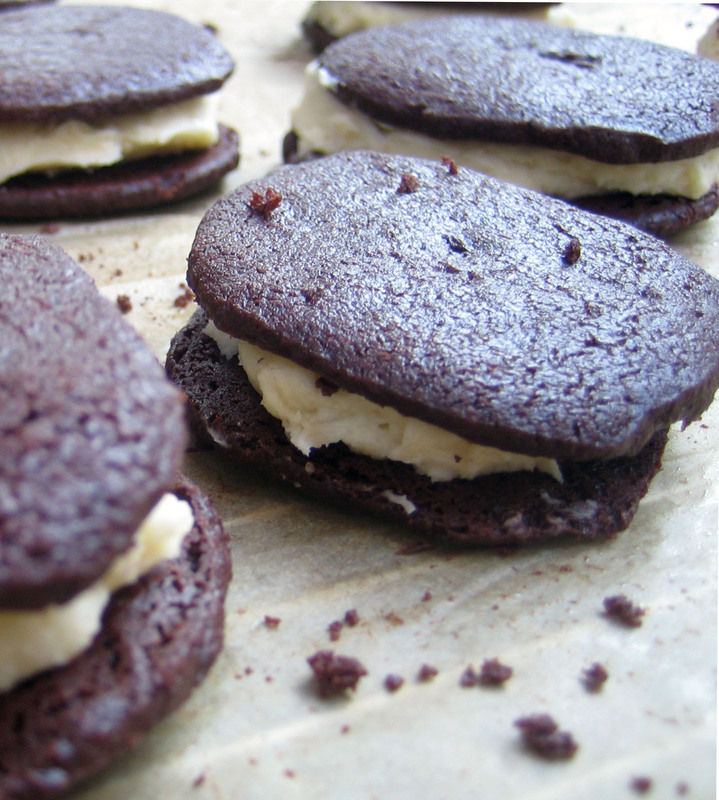 I’ll even tell you what I’m baking ... homemade Oreos! 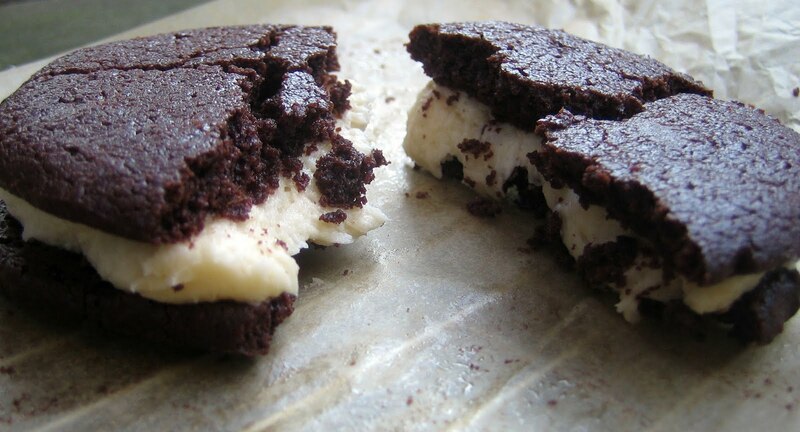 Buttery, chocolate cookie sandwiches with a creamy filling – this childhood favorite never looked so good. When I discovered Joanne Chang’s recipe for these nostalgic cookies, they sounded fun and decadent. This event was a hit last year and sold out within the first 90 minutes. Please come early and bring your sweet tooth. I hope to see you there! A year ago, I joined an amazing food community, Food52. I had never been part of an online community and it felt foreign to me to think of making friends online, rather than in person. What I discovered, though, is an incredible group of people scattered around the world, people who are kind, generous and supportive (much like the food blogging community). I have learned so much from these talented, creative cooks and feel connected in ways I didn’t expect. What a gift to find a place to grow, increase my knowledge and skills, be entertained and above all develop friendships. Last month, a group of us in the Pacific Northwest met in person and spent an afternoon talking, eating and getting to know each other better. This past week, some of us met again at a dessert potluck I hosted to celebrate The Food52 Cookbook (using recipes from Food52). This is what the website is all about – community, sharing and good food. Well, we had all that at our party! I made two desserts for this get together. The first one, Crème Vermont, happens to be the first recipe I ever made from Food52. I have a weakness for custard, and when you add maple syrup to it, well – I’m in heaven. 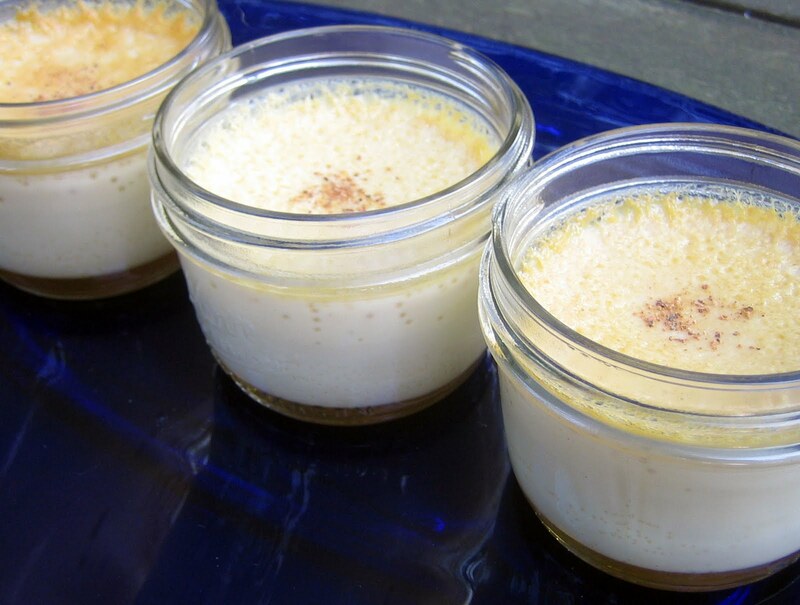 These custards are silky smooth, made with cream steeped in fresh ginger, cinnamon and cloves and poured over maple syrup before being baked. 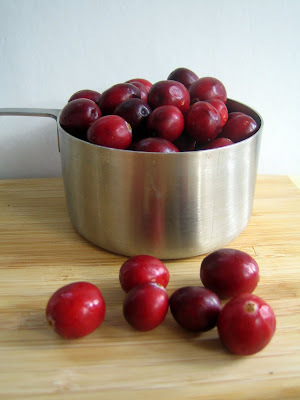 They can be served warm or chilled and are high on my list of favorite fall/winter desserts. 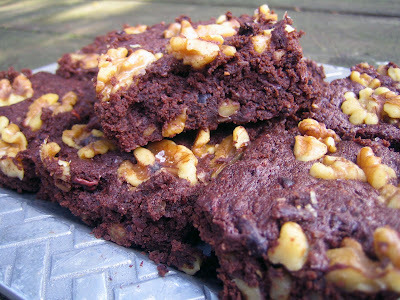 The other dessert I made was Buckwheat Brownies with Walnuts and Toffee. 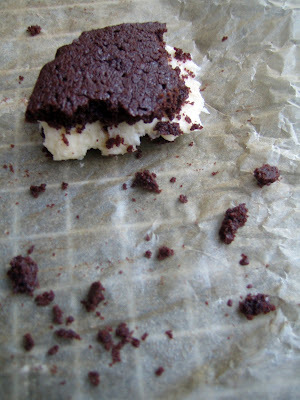 I didn’t have toffee on hand and I substituted cocoa nibs – so good (I also sprinkled some sea salt on top before baking). The brownies are moist and chocolaty, made with almond meal and buckwheat flour so they are also gluten-free. Some other desserts that guest brought were Gingerbread Bars with Hard Sauce Glaze, Spiced Parsnip Cake, Brown Sugar Cookies and Cappuccino Cheesecake. I can highly recommend all of them! 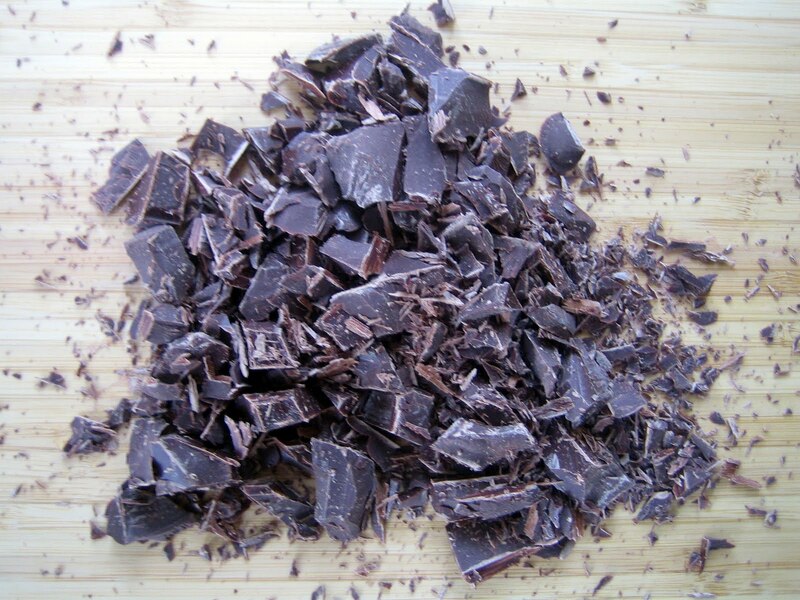 Another recipe I prepared was Cocoa Nib Brittle. I packaged it in little gift bags for guests to take home. I’ll be making this again quite soon – it’s a crunchy brittle with salted caramel and chocolate flavor ... perfect to give as a gift over the holidays or for house guests to nibble on. The Food52 festivities continued the next evening at Delancey, where Amanda Hesser and Merrill Stubbs (the creators of Food52) joined a local group of us at a potluck to chat, drink wine and eat delicious dishes we each prepared from the website. What a marvelous celebration! I am just delighted to be meeting such interesting, fun cooks who share my love of food and fun. I look forward to more such gatherings in person and to more online communicating. A toast to friends and food! There is a chill outside now. Not the crisp, delightful fall air, but a deep chill. This is the first year my son, Sam, has been driving and since he takes the car to school a couple days a week, he’s been learning about scraping frosty windows and turning on the rear defrost on these dark, cold mornings. Where did fall go? Didn’t it just arrive? 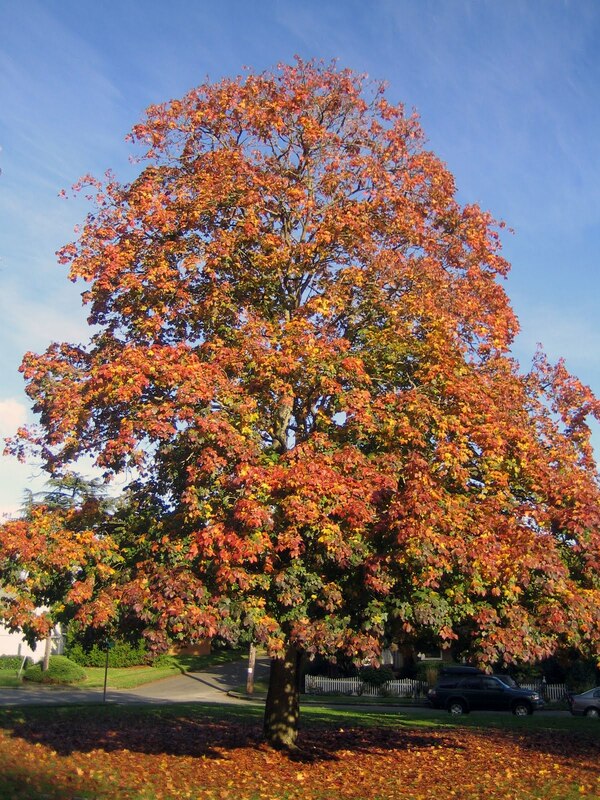 Our trees still have their gorgeous red, gold and burnt orange leaves, yet it feels as if autumn is slipping away. Quickly. I am craving heavier food now, food that will nourish and sustain my family. 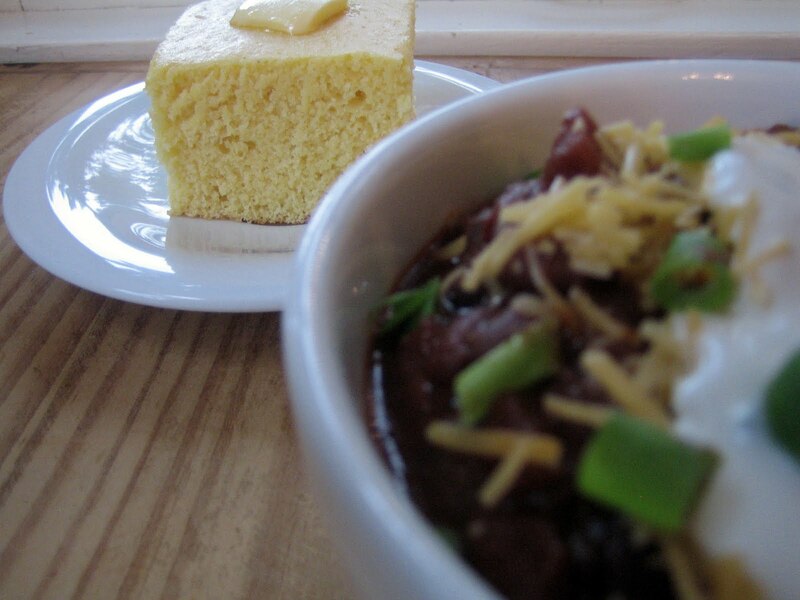 This Three Bean Chili comes through every time. It can be prepared using pantry staples – I always keep canned beans on hand for those times I haven’t soaked/cooked dry beans – and just requires whatever garnishes you prefer: onions, cheese, sour cream (and don’t forget the cornbread ...). 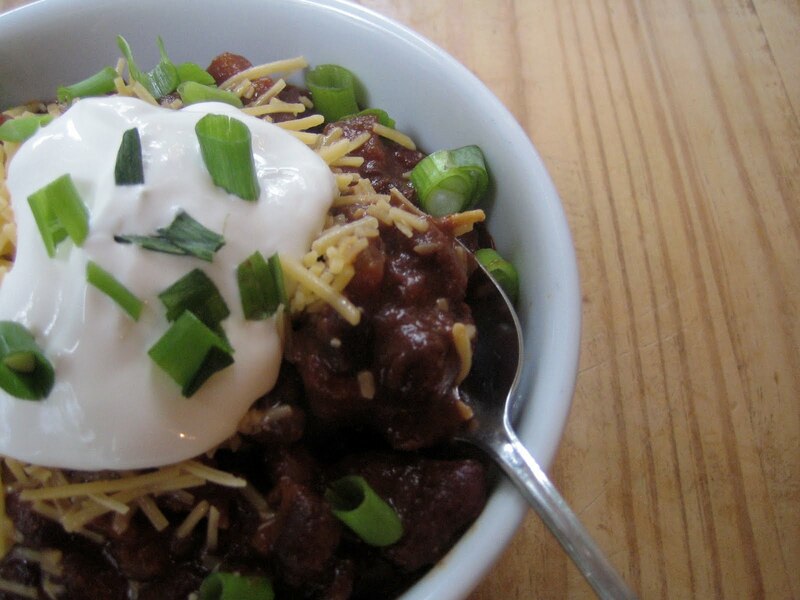 The chili can easily simmer on a back burner and be ready to enjoy after coming in from a frosty day. It also improves after a day or so, making it ideal to prepare on Sunday and have stashed in the fridge for a weeknight meal. Chili always evokes winter for me. 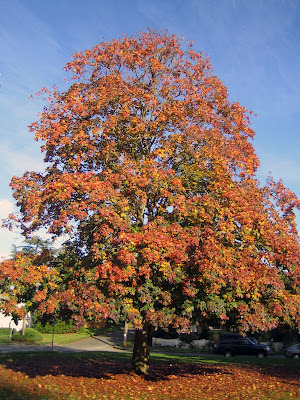 It’s remarkable how the seasons influence our palates and desires. The fresh basil and tomatoes of summer give way to fall’s squash and apples, and now I want winter’s rich, hearty soups and slow cooked dishes full of beans, greens and root veggies. I am quite happy with each season’s bounty - I appreciate the variety and savor what each has to offer. I know when spring arrives I’ll be pouncing on fresh asparagus and tiny strawberries with gusto. Until then, I’ll light candles, wrap up by a crackling fire, sip steaming cups of sweet tea and be warmed by a simmering stew. 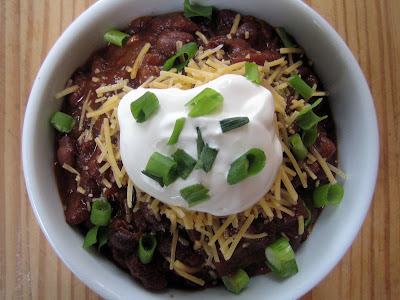 **This chili recipe is linked back to the Soup Blog Hop hosted by Katherine where you will find a great array of soup and stew recipes to enjoy. In a large soup pot, heat the oil over medium heat. Add the onions and garlic and sauté until soft. Add the jalapenos, chili powder, cumin, cocoa powder, pepper and salt. Stir until fragrant, about 1 minute. Pour in the beer, and add the tomatoes, the juices, tomato paste and beans. Stir and cook until it just starts to bubble. Partially cover the pot, lower heat to very low and let simmer for about an hour. Stir a few times to make sure it does not stick to the bottom. If you prefer the chili to be thicker, uncover for the last 10 minutes or so. Serve with onions, sour cream, cheese or other favorite garnishes. Are you ready for some chocolate? I always am, especially dark chocolate (in fact, I’ve become quite fond of 91%), so when I saw that the Book Larder was hosting Jack Bishop from Cook’s Illustrated magazine with a chocolate tasting – well, I had no choice, I had to attend. 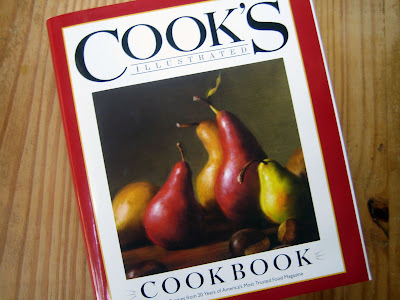 When I arrived at the shop for the event, I was given a copy of the new Cook’s Illustrated Cookbook. Let me tell you, this is a serious cooking tome, filled with 20 years of tested (and re-tested) recipes, and a book that I already know I’ll be turning to often. To start the evening, Jack Bishop shared stories about the magazine and some favorite tips. When creating a dish, the test cooks deconstruct a recipe (even something simple like a grilled cheese or hard cooked eggs) and analyze every step of the process and each ingredient to arrive at the perfect method of preparing. Recipes are routinely tested 60-70 times! As you can imagine, the test cooks can recommend many utensils and share lots of helpful tips. The most useful kitchen utensil (after your hands, knives and a cutting board)? An instant read thermometer. This is the only way you can accurately test your meat, custards and breads to see if they are cooked correctly. A favorite tip from a reader? When a pot is about to boil over, throw a couple of ice cubes in rather than trying to move the heavy, full pot (I’ll definitely give this one a try). Jack Bishop then taught us about the protocols of taste testing at Cook’s Illustrated. They only taste products that are available nationwide (or at least in more than half of the country) and are from grocery stores. Tastings are done in the morning, because in the evening your palate is tired and reflects what you’ve been eating that day. He passed out three little cups labeled A, B and C to each of us, all containing chopped up pieces of dark chocolate. We were instructed to let the natural heat of our tongues melt the chocolate and to taste for texture (more cocoa butter = more creaminess), the intensity of flavor (more cocoa solids = more complex flavor) and other flavor notes such as a roasted and smokey one or fruity and tropical one and, lastly, the sweetness of the chocolate. 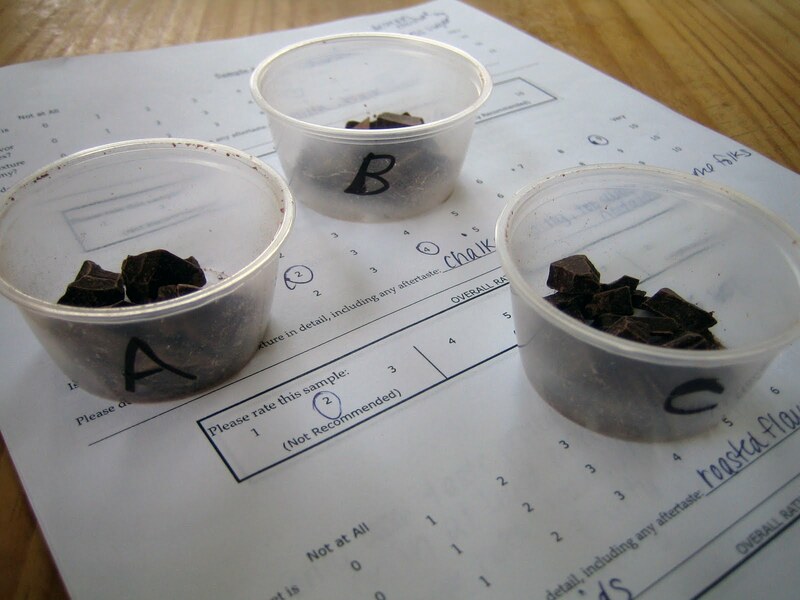 We rated all three samples on a numeric scale in each of these areas. My favorite sample was C, due to the roasted, espresso-like flavor, creaminess and relatively low sweetness. This turned out to be Ghiradelli (60%). 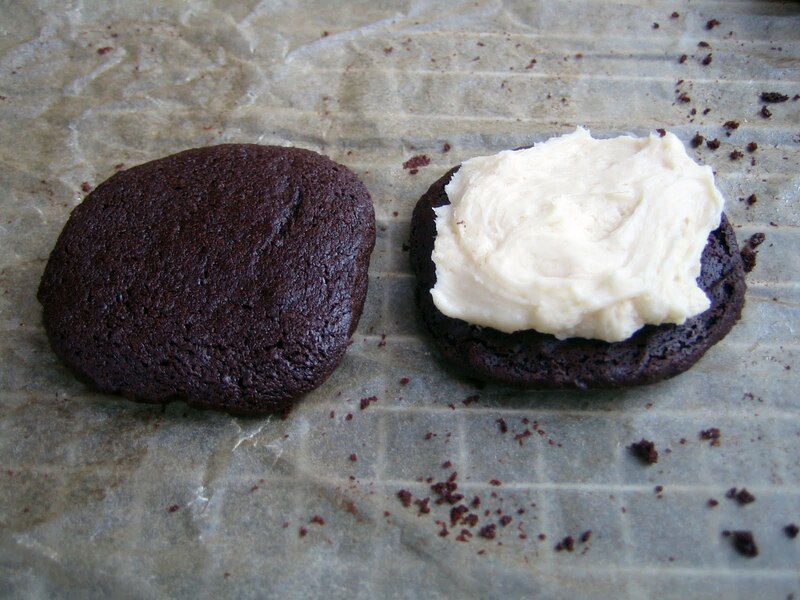 The other samples were Scharffenberger (60%) and Baker’s semi-sweet. Well, after nibbling and pondering cocoa solids and cocoa butter, I definitely needed to make something chocolate from the new cookbook! 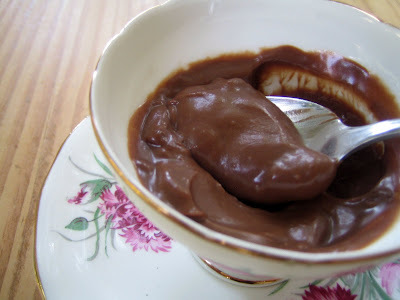 I settled on Creamy Chocolate Pudding ... an ultimate comfort dessert. I didn’t change a thing in the recipe - after all, it’s been tested! 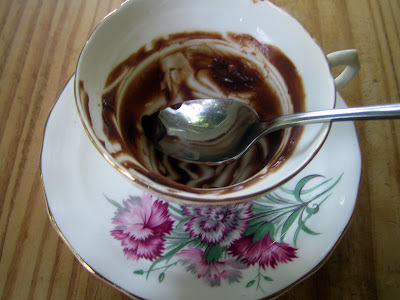 The pudding was sublime, intensely chocolate, soothing, creamy and luscious. 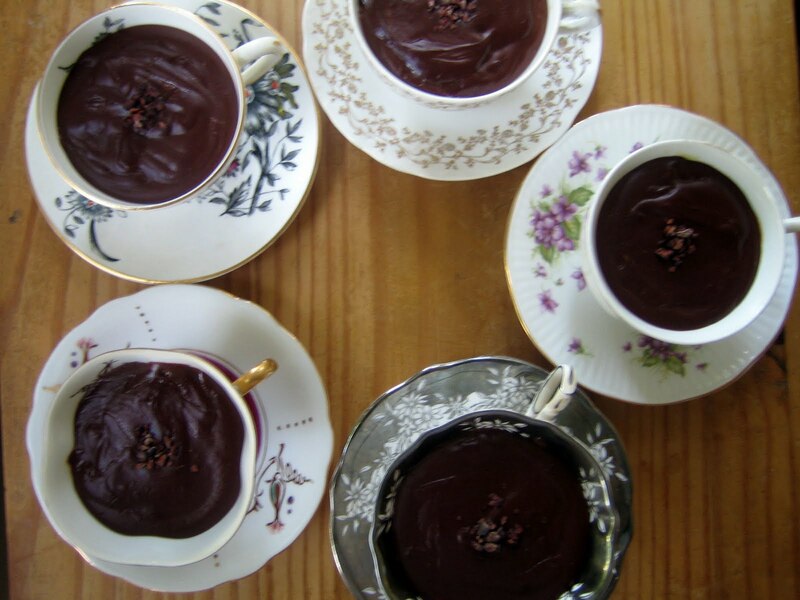 I served it in china tea cups from my grandmother’s collection, turning a nursery dessert into something elegant. 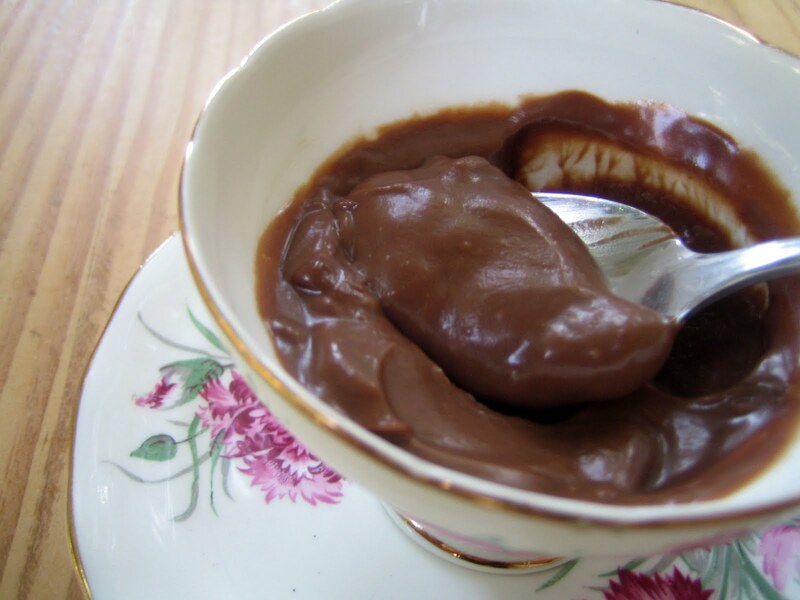 But really, you can eat the pudding straight from the sauce pan with a wooden spoon – nothing fancy needed. No matter how you indulge in it, I can promise you’ll be scraping your dish and licking your spoon as I did!